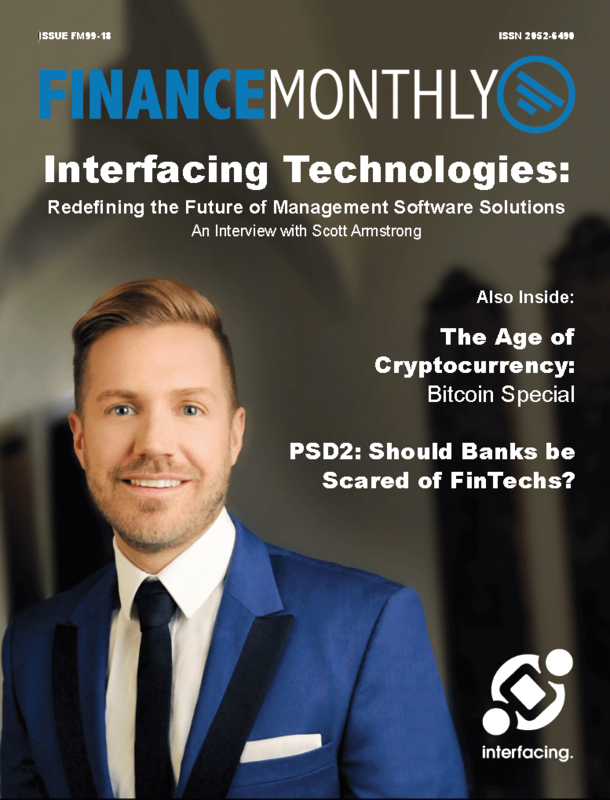 Interfacing Technologies showcased in Finance Monthly Magazine! 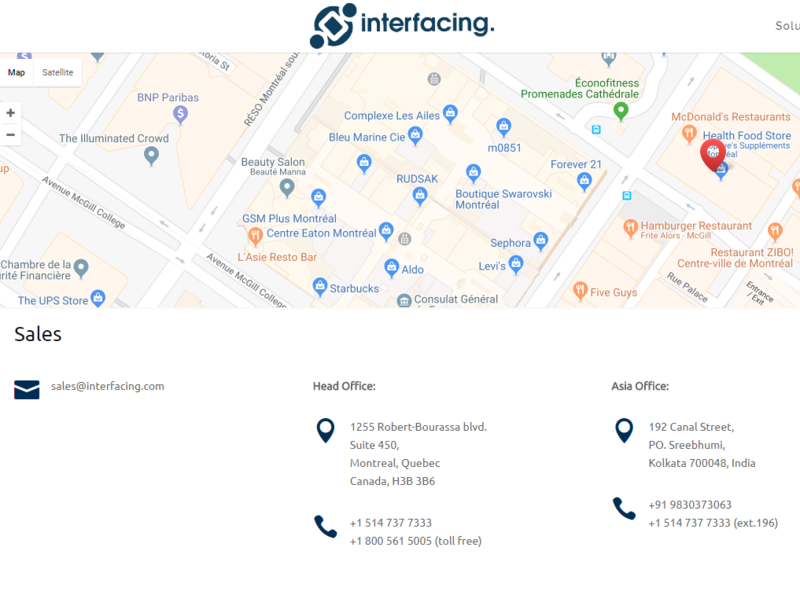 Headquartered in Montreal, Canada, Interfacing Technologies Corporation (Interfacing) has been developing award-winning software solutions for over two decades, serving both large & small organisations across the world. Recognised as not only a pioneer, but also a leader in the field (within Gartner Enterprise Business Process Analysis, Business Operating Systems & Operational Intelligence reports), the company provides quality management technological solutions to document, analyse, improve, and govern process, risk and performance data. 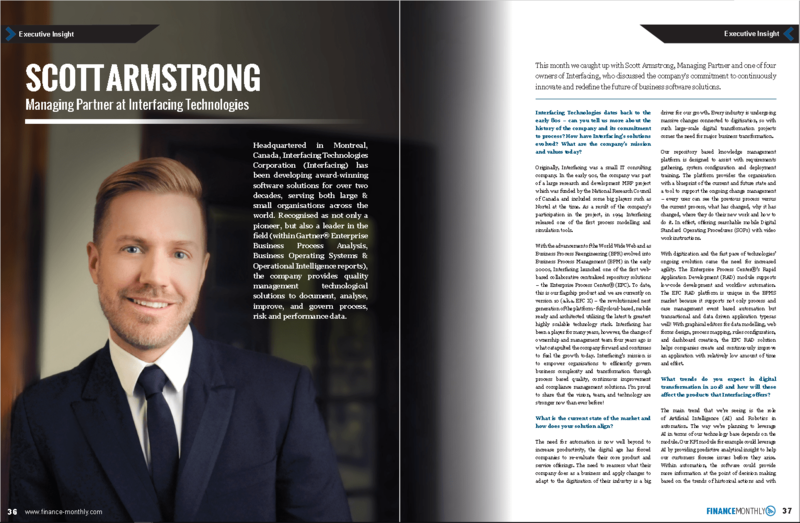 This month we caught up with Scott Armstrong, Managing Partner and one of four owners of Interfacing, who discussed the company’s commitment to continuously innovate and redefine the future of business software solutions. Interfacing Technologies dates back to the early 80s – can you tell us more about the history of the company and its commitment to process? How have Interfacing’s solutions evolved? What are the company’s mission and values today? Originally, Interfacing was a small IT consulting company. In the early 90s, the company was part of a large research and development MRP project which was funded by the National Research Council of Canada and included some big players such as Nortel at the time. As a result of the company’s participation in the project, in 1994 Interfacing released one of the first process modelling and simulation tools. 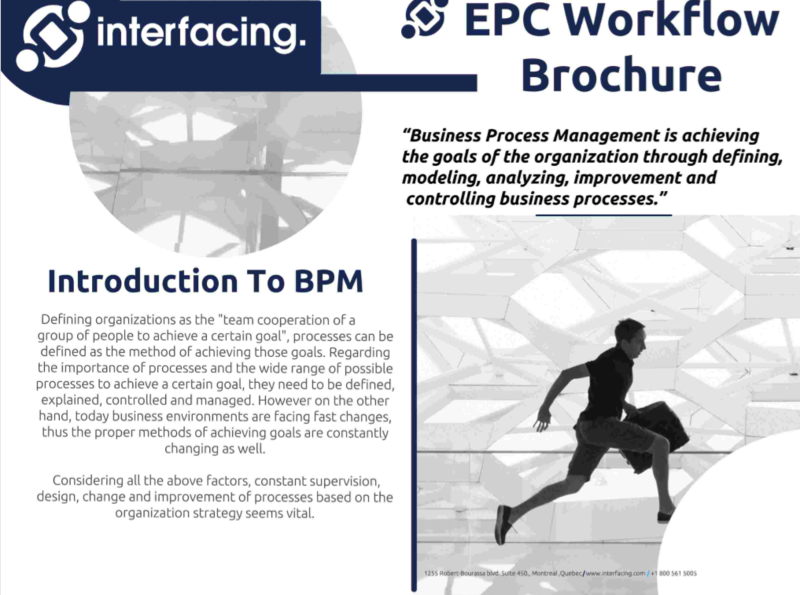 With the advancement of the World Wide Web and as Business Process Reengineering (BPR) evolved into Business Process Management (BPM) in the early 2000s, Interfacing launched one of the first web-based collaborative centralised repository solutions – the Enterprise Process Center® (EPC). To date, this is our flagship product and we are currently on version 10 (a.k.a. EPC X) – the revolutionised next generation of the platform – fully cloud-based, mobile ready and architected utilizing the latest & greatest highly scalable technology stack. Interfacing has been a player for many years, however, the change of ownership and management team four years ago is what catapulted the company forward and continues to fuel the growth today. 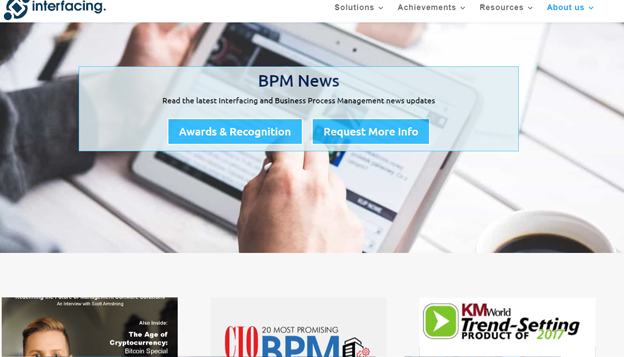 Interfacing’s mission is to empower organisations to efficiently govern business complexity and transformation through process based quality, continuous improvement and compliance management solutions. I’m proud to share that the vision, team, and technology are stronger now than ever before! What is the current state of the market and how does your solution align? The need for automation is now well beyond to increase productivity, the digital age has forced companies to re-evaluate their core product and service offerings. The need to reassess what their company does as a business and apply changes to adapt to the digitisation of their industry is a big driver for our growth. 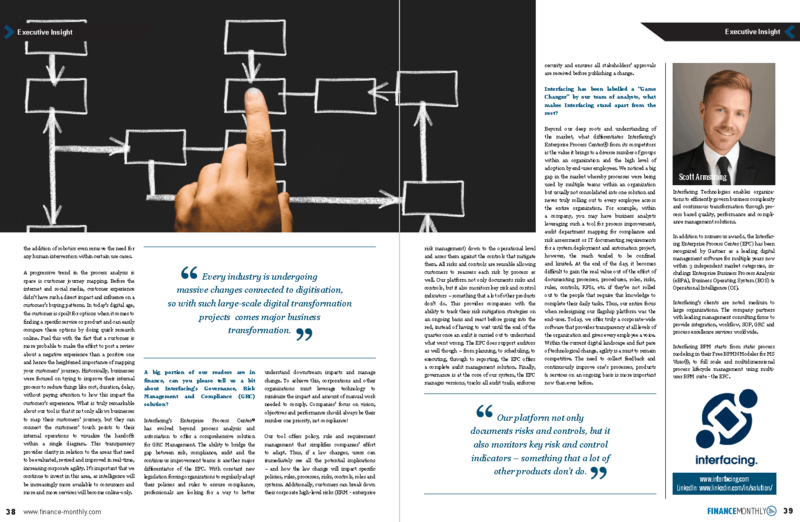 Every industry is undergoing massive changes connected to digitisation, so with such large-scale digital transformation projects comes the need for major business transformation. Our repository based knowledge management platform is designed to assist with requirements gathering, system configuration and deployment training. The platform provides the organisation with a blueprint of the current and future state and a tool to support the ongoing change management– every user can see the previous process versus the current process, what has changed, why it has changed, where they do their new work and how to do it. In effect, offering searchable mobile Digital Standard Operating Procedures (SOPs) with video work instructions. With digitization and the fast pace of technologies’ ongoing evolution came the need for increased agility. The Enterprise Process Center®’s Rapid Application Development (RAD) module supports low-code development and workflow automation. The EPC RAD platform is unique in the BPMS market because it supports not only process and case management event based automation but transactional and data driven application types as well! With graphical editors for data modelling, web forms design, process mapping, rules configuration, and dashboard creation, the EPC RAD solution helps companies create and continuously improve an application with relatively low amount of time and effort. What trends do you expect in digital transformation in 2018 and how will these affect the products that Interfacing offers? The main trend that we’re seeing is the role of Artificial Intelligence (AI) and Robotics in automation. The way we’re planning to leverage AI in terms of our technology base depends on the module. Our KPI module for example could leverage AI by providing predictive analytical insight to help our customers foresee issues before they arise. Within automation, the software could provide more information at the point of decision making based on the trends of historical actions and with the addition of robotics even remove the need for any human intervention within certain use cases. A progressive trend in the process analysis is space is customer journey mapping. Before the internet and social media, customer experience didn’t have such a direct impact and influence on a customer’s buying patterns. In today’s digital age, the customer is spoilt for options when it comes to finding a specific service or product and can easily compare these options by doing quick research online. Fuel this with the fact that a customer is more probable to make the effort to post a review about a negative experience than a positive one and hence the heightened importance of mapping your customers’ journey. Historically, businesses were focused on trying to improve their internal process to reduce things like cost, duration, delay, without paying attention to how this impact the customer’s experience. What is truly remarkable about our tool is that it not only allows businesses to map their customers’ journey, but they can connect the customers’ touch points to their internal operations to visualize the handoffs within a single diagram. This transparency provides clarity in relation to the areas that need to be evaluated, revised and improved in real-time, increasing corporate agility. It’s important that we continue to invest in this area, as intelligence will be increasingly more available to consumers and more and more services will become online-only. 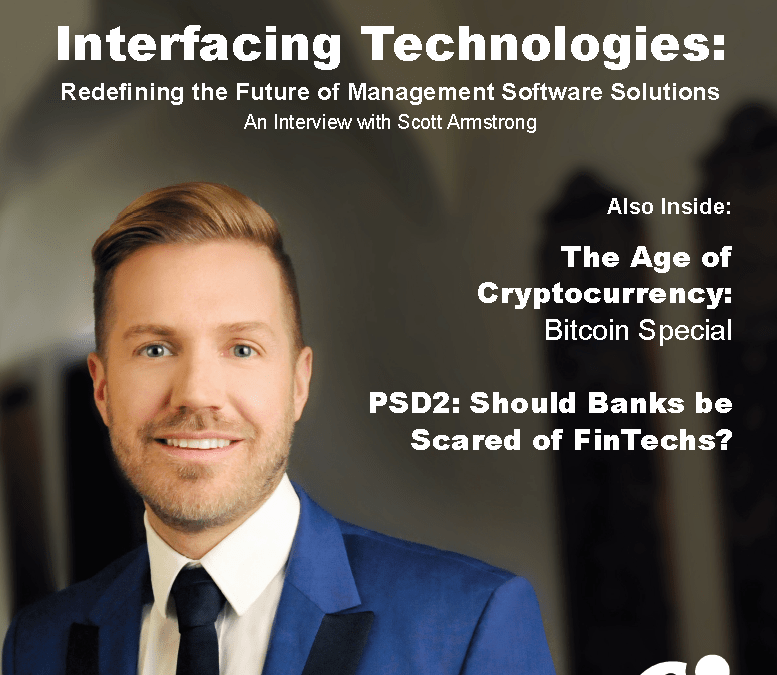 A big portion of our readers are in finance, can you please tell us a bit about Interfacing’s Governance, Risk Management and Compliance (GRC) solution? Interfacing’s Enterprise Process Center® has evolved beyond process analysis and automation to offer a comprehensive solution for GRC Management. The ability to bridge the gap between risk, compliance, audit and the continuous improvement teams is another major differentiator of the EPC. With constant new legislation forcing organizations to regularly adapt their policies and rules to ensure compliance, professionals are looking for a way to better understand downstream impacts and manage change. To achieve this, corporations and other organizations must leverage technology to minimize the impact and amount of manual work needed to comply. Companies’ focus on vision, objectives and performance should always be their number one priority, not compliance! Our tool offers policy, rule and requirement management that simplifies companies’ effort to adapt. Thus, if a law changes, users can immediately see all the potential implications– and how the law change will impact specific policies, rules, processes, risks, controls, roles and systems. Additionally, customers can break down their corporate high-level risks (ERM – enterprise risk management) down to the operational level and asses them against the controls that mitigate them. All risks and controls are reusable allowing customers to reassess each risk by process as well. Our platform not only documents risks and controls, but it also monitors key risk and control indicators – something that a lot of other products don’t do. This provides companies with the ability to track their risk mitigation strategies on an ongoing basis and react before going into the red, instead of having to wait until the end of the quarter once an audit is carried out to understand what went wrong. The EPC does support auditors as well though – from planning, to scheduling, to executing, through to reporting, the EPC offers a complete audit management solution. Finally, governance is at the core of our system, the EPC manages versions, tracks all audit trails, enforces security and ensures all stakeholders’ approvals are received before publishing a change. Interfacing has been labelled a “Game Changer” by our team of analysts, what makes Interfacing stand apart from the rest? Beyond our deep roots and understanding of the market, what differentiates Interfacing’s Enterprise Process Center® from its competitors is the value it brings to a diverse number of groups within an organization and the high level of adoption by end-user employees. We noticed a big gap in the market whereby processes were being used by multiple teams within an organization but usually not consolidated into one solution and never truly rolling out to every employee across the entire organization. For example, within a company, you may have business analysts leveraging such a tool for process improvement, audit department mapping for compliance and risk assessment or IT documenting requirements for a system deployment and automation project, however, the reach tended to be confined and limited. At the end of the day, it becomes difficult to gain the real value out of the effort of documenting processes, procedures, roles, risks, rules, controls, KPIs, etc. if they’re not rolled out to the people that require this knowledge to complete their daily tasks. Thus, our entire focus when redesigning our flagship platform was the end-user. Today, we offer truly a corporate-wide software that provides transparency at all levels of the organization and gives every employee a voice. Within the current digital landscape and fast pace of technological change, agility is a must to remain competitive. The need to collect feedback and continuously improve one’s processes, products and services on an ongoing basis is more important now than ever before.